the Vedic personification of the Moon. Man has a closer relationship with the Moon than anyother heavenly body, as the Moon has a direct effect on the earth in the form of tides and eclipses. It is the only place in space that man has set foot on, while there have been several unmanned missions, the latest being India's 'Chandrayaan - 1', which landed on the Moon in November 2008 and recorded the presence of molecular water. Of course, the Moon is the earth's satellite and is not a planet in the astronomical terms, but in all forms of astrology, the Moon is accorded the status of a planet. The Moon relates to emotions and personality and rules over the sign of Cancer. It is a feminine planet which is cold, moist, watery, phlegmatic and nocturnal. A native who has a strong influence of the Moon has a fair stature, pale complexion, round face, bright eyes, short arms, thick hands and feet, smooth, corpulent and phlegmatic body. The Moon is easily influenced by every other force and this planet is more sensitive to the influence of the signs of the zodiac than any of the other planets. In fact, what accounts for greatest difference in two lives born only a few moments apart, is the slight change in the degree on the ascendant and the position of the Moon. This is the reason why twins can often be so unlike each other. Apart from the fact that the signs themselves affect the Moon, the subdivisions into decades also has an equally great effect. If the Moon has a favourable influence in the individual's horoscope, this person will be timid, soft spoken, ingenuous and polite. He or she will be quite averse to disputes or troubles of any kind. When the Moon is unfavourably aligned, the native is bound to be idle, stupid, petty and fond of alcohol. The Moon governs the brain, the stomach, the bowels, the bladder and the left eye. It also has much influence over the fluids of the body such as saliva, the lymphs glands and in case of women, the breasts. If the Moon rules over the house of fate, it has a strangely dual effect on the influence it can have on the person. It's vibrations can produce either extreme purity and devotion to the higher things or it can make one a slave to one's emotions. People born under a strong influence of Moon should choose their associates with care and try and adopt a regime of rigid discipline. Otherwise, they are in danger of falling prey to laxity and being casual about life. When the Moon is the ascenant's lord, the individual will be quite sensitive, emotional and will naturally absorb all kinds of influences. Therefore, the native must be discriminating between true and false, between things that are worthwhile and those which are less useful. The natives of this sign are not the greatest followers of the middle path. When one is under the influence of this planet, one is usually extremely adaptable, versatile and has a tendency to take advantage of opportunities. However, if the influence of this planet is very strong, the native may be too pliable for their own good. When the Moon is dominant, the native is prone to change their vocation early in life, even if this had been an avenue with potential. Such a person may undergo many changes to their reputation or social position. However, the native is not destined to lead an obscure or uneventful life and therefore, must plan his/her affairs such that their good name is not tarnished at any point in the future. This planet often brings the native opportunities to play important roles in public affairs. The Moon rules the populace and as such, many who enjoy great popularity and who influence the masses are born with a strong Moon influence. The Moon also governs the home. Therefore, women who have a strong influence of this planet, make good wives and mothers. However, they are prone to frequently changing emotions and can find it necessary to have a large circle of acquaintances and tend to be free spirits. Any constraints on their freedom will lead them to become restless and discontented with their domestic lives. Men who are strongly influenced by this planet are likely to attract women of a more masculine nature and some might say that they become 'Henpecked husbands', unless they cultivate will and grow more self-assertive. The Moon enjoys great importance, although she is of negative influence, because she represents the sensorium. Being of swifter in motion than the other planets, the influence of the Moon is of very great importance and she forms more aspects. In Sanskrit the Moon is called 'Chandrama' or 'Chandra' and these names are used in Vedic astrology. Moon is the queen among planets, and represents the mind. It signifies emotions, passions, feelings, love, fickle mindedness, frequent changes, instability, kind-heartedness, truthfulness, righteousness, optimism, and sweet speech. The Moon also represents the mind. It is the lord of Cancer. It is exalted in Taurus, and debilitated in Scorpio. Diseases associated with the Moon are obesity, rheumatism vertigo, colic ailments, palsy, apoplexy, seropila, small pox, dropsy and the most important of all, lunacy. A malefic Moon can cause functional disorders, venereal diseases and nose inflammation. The Moon gifts a youthful appearance and physical attractiveness. The corresponding gemstones for the Moon are pearls or moonstones. It is associated with the colour white. 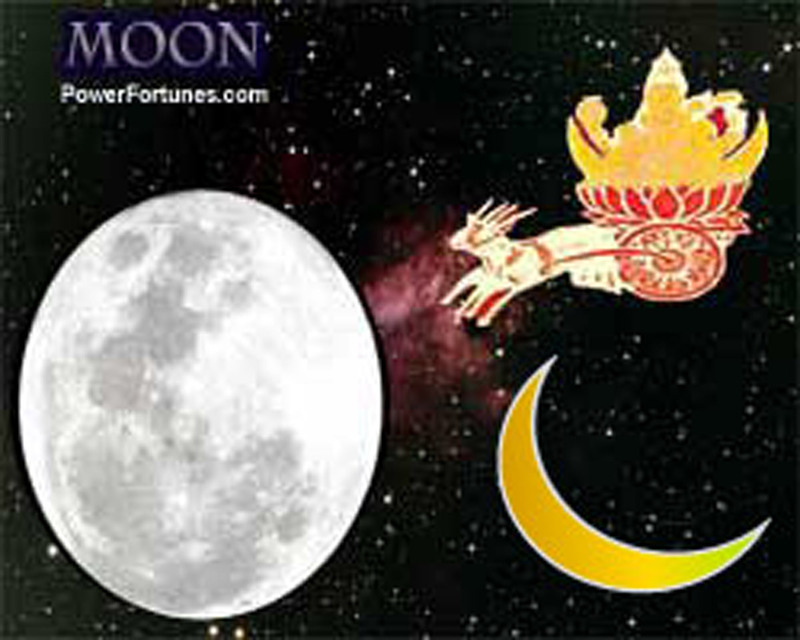 According to numerology, Moon's number is '2'. It is the lord of the north direction and monsoons. Its influence is mainly seen during the night. The waxing Moon is benefic, while the waning Moon is malefic. The direction associated with the Moon is, North-West. The corresponding talisman for Moon is the 'Chandrama Yantra'.